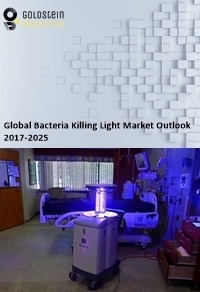 Goldstein Research analyst forecast that the global bacteria killing light market size is set to reach USD 1,520 million by 2025, growing at a CAGR of 4.73% over the forecast period. Innovation in bacteria killing lights, growing pollution and communicable diseases, environment, human and animal friendly innovations are the major factors impacting the growth of global bacteria killing light market. The report covers the present ground scenario and the future growth prospects of the bacteria killing light market for 2017-2025 along with the global sales and global revenue of bacteria killing light. We calculated the market size and revenue share on the basis of revenue generated from major players across the globe. We have forecast the market on the basis of bacteria killing light manufacturers, suppliers and distributors, research and development, revenue from industries using bacteria killing light. On the basis of End-user, Hospitals/clinics/nursing homes accounted for largest market share of 32.7% in 2017 of global bacteria killing light market. To maintain hygiene and cleanliness, it is essential to make hospitals/clinics/nursing homes equipped with bacteria killing lights. The growth in healthcare facilities such as in European countries, are inducing the demand for bacteria killing lights. There is growing demand in residential sector, contributing 4.1% growth to global bacteria killing market, owing to the availability of portable bacteria killing lights to sanitize the surrounding things. Bacteria killing light market outlook 2017-2025, has been prepared based on an in-depth market analysis from industry experts. The report covers the competitive landscape and current position of major players in the bacteria killing light market. The report also includes porter’s five force model, SWOT analysis, company profiling, business strategies of market players and their business models. Global bacteria killing light market report also recognizes value chain analysis to understand the cost differentiation to provide competitive advantage to the existing and new entry players. For bacteria killing inventions are coming up using lights of different wavelengths and minimum or no harmful impacts on health and environment. A new type of lightbulb is manufactured by Kenall Manufacturing, named as Indigo-Clean in 2008, that can kill bacteria and viruses in seconds. It is regarded as a revolution in the traditional way of treating bacteria and germs. As the cities are getting smarter, the same way the congestion and population is rising in major cities across the globe, especially in developed economies. This leads to increase in the level of water and air pollution which are suitable conditions for the growth of harmful bacteria. In order to maintain the hygiene and to create clean environment, various hospitality facilities adopted killing bacteria lights. Hotel & restaurant owners are more inclining towards killing bacteria lights to create a livelihood environment inside the facility. In addition to this, the sales of killing bacteria lights is up surging, backed by the growing demand in residential sector. On the other hand, products made for hospitals and other healthcare facilities such as diagnostic laboratories are also gaining traction among the end-users. On the basis of sales graph, manufacturers are working upon competitive pricing as the number of product offerings are increasing rapidly. This leads to decrease the supplier bargaining power and increase the buyers bargaining power. This major factor further helps the industry players to generate more revenue with large number of product sales with fewer profit margins. However, use of bacteria killing lights has health hazards and risks, as it uses UVC that can be harmful to eyes and skin. From acute effects like redness on skin and temporary eye inflammation to chronic effects like skin ageing, skin cancer and ocular cataracts, can lead the consumers to discontinue the use of bacteria killing lights. Such harmful impacts have direct impact on the sales and revenue of the companies providing bacteria killing lights. Based on geography, Asia-Pacific region accounted for largest market share of 28.3% in 2017 of global bacteria killing light market; owing to huge population and development activities at a large scale are causing pollution and disease prone areas, which are stimulating the growth of bacteria and viruses. Thus there is growing demand from APAC region for installation of bacteria killing lights at residential, commercial and industrial areas. North America bacteria killing lights market is growing at a rate of 5.7% annually as the major players manufacturing bacteria killing lights are established within this region. Global Bacteria killing light market report comprises of the following companies as the key players in the bacteria killing light market: Indigo Clean, 3M, UV Light Technology Limited, Johnson & Johnson, Spectroline, Reckitt Benckiser Group Plc., Proctor and Gambler Group, Foshan Cnlight Ecommerce Ltd.
What is the revenue of bacteria killing light market in 2016-17 and what would be the expected demand over the forecasted period?